Let me just start by saying that I commend anyone, who takes the time to teach and lead their dog, regardless of how successful they may actually be. The reality however, is that if your dog doesn’t listen around distractions, or if she doesn’t listen if theres “something else she wants to do” then your dog isn’t obedient. The very function of obedience is that you can have your dog perform a task, at your command, regardless of whether they want to or not. Yes, in an ideal world we would always be able to make the dog want to do the things we ask. But the real world doesn’t work that way. There are too many conflicting motivators such as rabbits, squirrels, other dogs, smells, noises etc. that are often way more exiting than the prospect of maybe getting a morsel of food from us, and most of us have no interest in always carrying around t-bone steaks in our pockets and purses. The very definition of a command however, is that it is a big deal! Because we are fair leaders, we as much as possible, try to reward good behavior and obedience. Yet, just because I am willing to pay the dog for their efforts, does not make the work optional. Unfortunately, the majority of dog trainers these days, don’t teach commands anymore. Dogs do what they want, when they want, and this often leads to trouble. I firmly believe that this fact is the root of 90% of the behavioral issues that dogs have. Dogs need rules, they need structure and order in their lives, and without these things, many become unbalanced. The following clip is of Coco, a 7 month old Airdale Terrier. She started training with us 3 weeks ago, and prior to that did not have any obedience work. She is practicing the ‘place’ command, and a down-stay. No she doesn’t want to be doing it, she would rather be running around with my dog. She is learning that rules are rules, and they have to be followed. She is not unhappy, in fact her tail is wagging throughout half the video, and she is showing a tremendous amount of self control, especially for a dog her age. I am proud of the work she has done in 3 weeks, and when working with her, it is clear that she is proud of herself too. True obedience gives the dog a sense of purpose. All of us are happier when we feel we have a function in the world. http://connectwithyourk9.com/wp-content/uploads/2015/08/stickylogo.png 0 0 Tyl3r-Mut0 http://connectwithyourk9.com/wp-content/uploads/2015/08/stickylogo.png Tyl3r-Mut02012-03-04 11:45:032012-06-27 00:37:18Exceptional Obedience, or Obedience With Exceptions? Have you ever noticed that nearly everyone in the world believes that they are an expert on what is best for your dog? Personally and professionally, I have found that one of the toughest areas of training can be teaching good greeting behavior. I’m not talking about the dog training part of it. It’s the people training that’s real tough. The dog is easy, teach him to stay on his “place”, make sure he knows that there is a clear and predictable set of rewards and consequences related to that behavior, and viola! But the humans have their own agenda. Well. . . . I devised a solution to this conundrum several years ago that is based in the ridiculousness of human psychology. There is one great truth known to mankind: Humans are suckers for talking dogs! 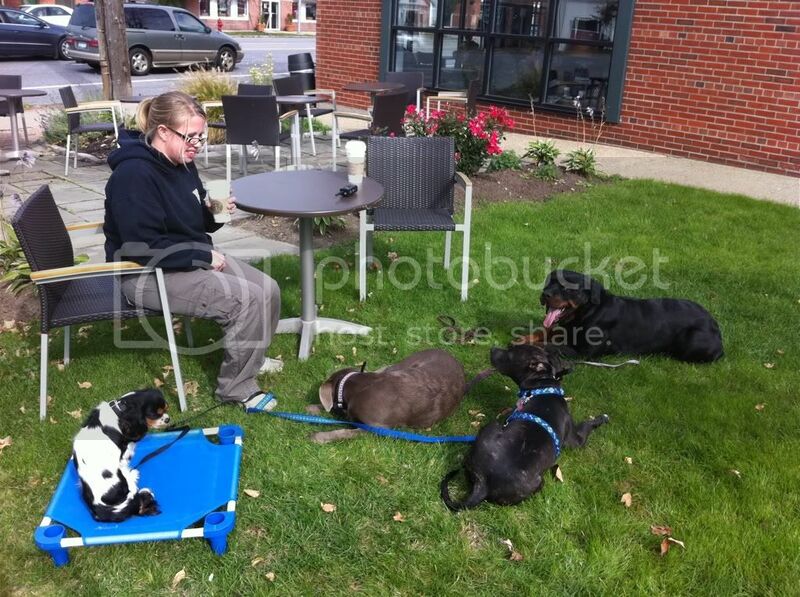 That’s right, tell the humans yourself to ignore the dogs, and you can bet that your words will fall on deaf ears. But have the dogs say it. . . . . and you’ll be cookin’ with fire. That’s right, us Silly Humans will do anything the dog says. I was in Rochester yesterday and stopped by my dad’s studio to say hello. Some of you may not know that my dad is an incredible artist. Here he is working on a piano he was commissioned to design and paint for Steinway and Sons. Yep, I come from good stock. Pressure is a term that I use a lot when discussing dog training. The concept of pressure is somewhat central to my system of training and influencing dogs’ behavior, and understanding how pressure works will make anyone a better handler. The most important to remember is that pressure motivates, and the release of pressure educates. Say that out loud, repeat it and let it sink into your memory. Any pressure, to be motivating, is by its nature going to be aversive. The degree of aversiveness can, of course, vary from mildly annoying, to painful. Ideally, when working with dogs, we want to be as minimally aversive as possible. Although a dog may encounter many sources of pressure throughout their lives, there are three main types of pressure that we use to influence dogs. Physical Pressure is probably the most natural for people to think about. Examples of physical pressure are: leash pressure, guiding with hands, or even electronic pressure. I would even consider the pressure from and unpleasant noise, or smell to be a physical pressure. Social Pressure is often undervalued. Social pressure can be strong eye contact, stern voice, and assertive/forward body language. The most practical use of social pressure that I find, is using eye contact and body language to move a dog and claim space. Because you are creating space, some may call this spacial pressure. Among horsemen, this technique is often referred to as yielding. Social pressure is likely to be the most primal form of pressure. Nearly all animals who live within social groups use this as a part of their dominance rituals. Achievement Pressuremay be a made-up term, I’m not sure. I use this term to refer to the type of pressure we all feel when there is something that we strongly want to achieve, and we have to figure out how. This is the type of pressure associated with positive reinforcement training. Of all the types of pressure, for the average dog this is likely to be the least stressful or aversive. Although for an extremely driven dog, achievement pressure can actually create a significant amount of stress. 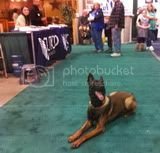 Unfortunately, it is un likely that anyone would be able to adequately train a dog using only capturing techniques, so understanding how achievement pressure works, and how it can be stressful is still important, even for the “reward-only” dog trainer. Again I must re-state, this is not intended to be a scientific, or exhaustive definition of pressure. It is meant to be functional, for the purpose of further discussion of my training techniques and philosophies. There will definitely be more to come on this topic, so check back soon! I commonly preach to my clients on the benefits of regularly practicing obedience exercises with their dogs that require self control. I of course, only based this piece of advice on my own experience as a professional trainer, having trained thousands of dogs. I certainly had no scientific evidence to back me up, but I preach this like a religion. This simple idea is the reason behind why I instruct my trainers who conduct classes here to put so much emphasis on the down-stay position, or a simple place command. These two exercises are the cornerstones of self control in the dog training world. Recently however, science stepped into my corner. The Journal of Experimental Social Psychology recently released a study titled: “Building self-control strength: Practicing self-control leads to improved self-control performance”, confirming what I had learned through experience. Quite simply, the study found that Self-control performance may be improved by the regular practice of small acts of self-control. Ninety-two adults’ self-control capacity was assessed using the stop signal paradigm before they started practicing self-control and again at the end of 2 weeks. Participants who practiced self-control exhibited significant improvement in stop signal performance relative to those who practiced tasks that did not require self-control. Participants who did not practice self-control believed that the tasks should improved self-control, engaged in tasks that were effortful and made self-control salient, but did not actually require self-control. Supplemental analyses suggested that only practicing self-control built self-control capacity. K9 Connection trainers Amber and Josh practicing controlled pack walking with 8 dog at once. Your dog wants to go in front of you, of course she does, every inch of her body is telling her to move faster than you. Her ability then to slow down and walk at your pace, is directly related to her capacity for self control. By taking your dog for two controlled walks a day, you can greatly increase her ability to utilize self control in all aspects of her life. The staff here at K9 Connection, including myself, recently completed a workshop in canine socialization which had it’s main focus on understanding the causes and dimensions of inter-canine aggression. Although it may be argued that standing alone this model does not represent a complete understanding of the causes of aggression, I believe that it does supply a very practical vantage point that every dog owner can benefit from. Every dog has a pre-determined stress threshold, beyond which they can potentially become dangerous. The stress threshold itself is generally unchangeable. Various factors in a dog’s life can add “layers” of stress, each of which brings the dog closer to their threshold point. Layers of stress can be diminished or eliminated by: a) removing the stressor, or b) changing the dog’s response to that stressor through counter-conditioning. The more “layers ” of stress we remove, the less likely any one specific event is to push the dog beyond the threshold point and result in aggressive behavior. This model is very practical if we begin to look at the behavior of an individual dog. Lets take an example of “Snarly” the terrier. Snarly has a history of being very reactive when company come over to the house. He is fine as long as people are sitting down and behaving relatively calmly. However, if someone gets up to use the bathroom or makes a sudden movement, Snarly will get up and lunge at the guest potentially biting. The action of someone getting up or making a sudden movement is for Snarly a specific stressor that pushes him beyond his threshold, thus putting him in the danger zone. While it is appropriate to work with this specific context by desensitizing Snarly to peoples movements and counter-conditioning him to respond differently. It can be of great importance to also look at other areas of Snarly’s life and work to remove or reduce any layers of stress possible. To be more clear, lets give numerical values to stress. Lets say that Snarly’s threshold is 150 units on the stress scale. What this means is that if his stress level goes beyond 150, he is likely to snap. Now lets look at various things in Snarly’s life. Snarly lives with very inconstant humans, who don’t always give clear commands that he understands, but rather tend to speak to him in full sentences that he has to decipher. The confusion adds a relatively constant stress level of 20 to Snarly’s daily life. Snarly also does not get regular physical exercise, and often has pent up energy which leaves him feeling a little “edgy”, this pent up energy adds another 30 to Snarly’s stress level. Snarly also is getting older now and is developing some arthritis in his joints, this discomfort ads another 30 to his stress level. So before guests have even arrived, Snarly is living with a stress level of 80. This medium level level of stress may not be visibly apparent to his owners, but it is there regardless. Now arrive the guests, and having strangers in the house adds 40 more stress points. And finally, quick moments by those guests add 50 more stress points. We suddenly find poor Snarly’s stress level at 170! Well beyond his threshold and he snaps. If you are like me, you can relate to Snarly’s situation. When I have a bad day, it typically is compiled of lots of small stressful events that continue to build. Eventually one small thing, something that normally is very tolerable, puts me over the edge, and I snap. So, if we really truly want to help snarly, we need to look at the whole picture. Lets add constant consistent obedience training and clear human leadership to Snarly’s life. This brings stress of living with humans down to 5. Let’s also add consistent structured exercise to Snarly’s daily routine in the form of controlled walks, and playtime with his humans in the back yard (not by himself). This eliminates the stress caused by the edgy feeling of pent up energy. We also take Snarly to the veterinarian and add a supplement to his diet to help with his arthritis, thus reducing the discomfort. Bringing the stress from that condition down to a 10. Now we have reduced Snarly’s daily stress level to down to 15. See where I’m going here? Company then arrives, adding 40, somebody makes a sudden movement adding 50, we still are only at an overall stress level of 105! Suddenly Snarly isn’t biting people anymore. Of course, dogs are creatures of habit, so unless we started making this changes very early in Snarly’s biting career, it is likely that he has developed a conditioned response to people moving around. However, since we have removed enough stress, counter-condition this behavior and teaching Snarly to lay calmly in his his bed is now a breeze, since he is well below his threshold of stress, and thus perfectly capable of coping with those actions. T-minus 2 days to Chad Mackin an his Pack to Basics workshop! This is what dogs should look like after they have been exercised! This is after our morning hour long walk around Tonawanda. 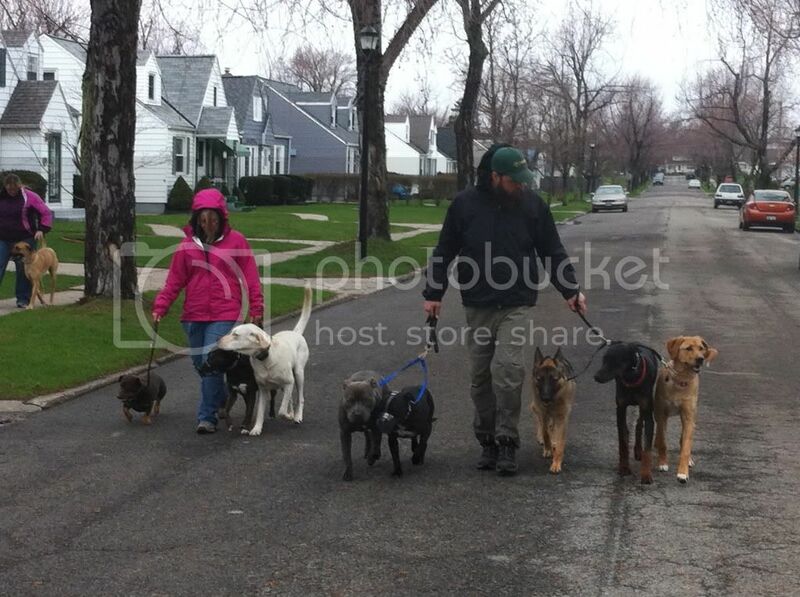 We take our boot camp dogs (brindle guy on the far left) on many walks around the neighborhood. To help them learn to do it nicely. Before I get too involved in this post, let me just start by saying that there is a big difference in my mind between training dogs for competition obedience, and doing what I term “Real world dog training.” Don’t get me wrong, there are a lot of similarities as well, the most important being that both are grounded in the use of learning theory and classical and operant conditioning. However, understanding the differences can be very important especially for the individual who is filtering through the masses of conflicting information about training methods out there, and trying to determine what is best for their dog. In my view, one of the most important distinctions in this matter is the Type of dogs used for the competition style training. When I say type, I am not referring to breed, but rather to individual traits that can vary across breeds. Most importantly, the overall motivation level, or drive, of the dog. Since most modern competition style training is founded primarily on the use of positive reinforcement, the drive of the dog is an extremely important factor. How much overall motivation your dog may have is in large part (not entirely) determined by genetics, and it matters because the more the dog wants what you have, the harder he will work to achieve it. In other words, the higher the dog’s motivation or drive state, the more you can do with positive reinforcement alone. The average pet dog can vary widely on this singular trait, and where your dog falls on this spectrum will in a large part determine how successful you may be in a positive only training program. This does not make the dog “better” or “worse”, it just means that we need to balance our training accordingly with the use of positives and negatives to achieve the optimum result (my philosophy on balance in dog training is a separate topic). The flip side of all this is that although the more motivated dogs can often be easier to teach, they also are often the more difficult dogs to live with. They tend to be more active, more curious (which often leads them into trouble), and more in need of physical and mental stimulation. Thank you to Ed Frawley of Leerburg.com for producing this video making Michael Ellis’ expertise available to a wider audience. This is what two 7 month old Golden Retrievers look like after a good training session, exhausted! Sabertooth and Thriller were just signed up for group class, and they’re going to do great!